Two great attractions, one fun city! You know I love Cincinnati but sometimes it’s nice to go on a mini-vacation. Over spring break, when many of our friends were heading to the beach or Disney World, we were home. The “dreaded budget” didn’t have room for a spring break trip this year but we did have room for a weekend get-away. We decided to head to Columbus. Lucky for us, we have friends who live there and they graciously let us stay at their place for one night. For the other night, we booked an affordable room at the Holiday Inn Express. My girls get so excited when we stay at a hotel. As long as there is a pool, they are happy. As long as it is clean, I am happy. I was actually impressed with this hotel. The beds were super comfortable with crisp clean white sheets and since we were only staying for one night, we sprang for a suite so we had some additional space (we paid $118). The next morning we enjoyed a nice continental breakfast that was included with our stay. When I look for hotels now, I only book at places that offer the free breakfast (that can save a family of four at least $25-30). 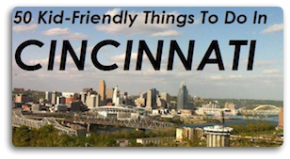 Columbus also has lots of great family-friendly things to do but we decided to focus on two of their best attractions: COSI and the Columbus Zoo. If you’ve never been to COSI, you really should make the trip. COSI stands for the Center of Science and Industry and it is an outstanding facility filled with interactive exhibits, science demonstrations, and more. There is no way that you will be able to see COSI in one day. We ended up buying a family season pass for only $88. The normal ticket price for a family of four would have been $45 ($13.75/adults & $8.75/youth) and since I knew we would visit COSI again within the year, we opted for the season pass. Not only can we enjoy COSI as many times as we want, we also get to enjoy the Cincinnati Museum of Natural History for free. There are also other museums that have a reciprocal relationship with COSI so your admission is free when you show them your COSI membership card. You might ask why I didn’t I just buy a season pass at the Cincinnati Museum Center? Well, lucky for us, my Mom already has a season pass that enables me and my girls to get into the museum with her free of charge. COSI was hopping on our visit but we still got to see a lot. My girls’ favorite exhibit was the Ocean area where they could enter a mini-submarine, operate an underwater camera and control these enormous water cannons (bring an extra shirt if you head here). They also love the gadgets section and particularly liked the idea of sitting on a seat and hoisting themselves up by using a pulley – all by their own strength. I did not attempt this since our body weights are a tad different and my upper arm strength isn’t what it used to be. COSI also has a great area for preschoolers called kidspace®. It’s a large interactive area with plenty of fun things to do (water area, play structures, pretend veterinary and doctor’s office). The great thing is that the area is enclosed and monitored so if you let your little one roam, you don’t have to worry that they are going to walk out. I was a little sad when we visited this part of the exhibit, K & S seemed so big compared to some of the other kids and by next year, both girls will be too old to enter. One of the traveling exhibits we got to see was Grossology but unfortunately, it will only be there to gross you out until May 9. For our second day, we headed to the Columbus Zoo. I am very partial to the Cincinnati Zoo but the Columbus Zoo is definitely one of the top zoos around. The place is HUGE so you will not be able to see it all in one day. They also have reciprocal zoo relationships, and if you have a Cincinnati Zoo membership then you’ll be able to get a 50% discount off your admission fees. We ended up purchasing single day zoo admission tickets – $12.99/adults 10-59 and $7.00/kids 2-9 & 60+ and parking is $5. The Columbus Zoo also has a new mini amusement park, Jungle Jack’s Landing, and they were offering a BOGO admission so we also bought tickets for that. The all you can ride wristband ($8), also allowed us to ride the train in the zoo. We didn’t even get to see the Carousel or the Islands of Southeast Asia boat ride. If you’re visiting the zoo for the first time, I’d recommend reviewing your map before you start your journey. We ended up heading to the right so we saw the North American exhibit first. We went on a train ride here and my girls enjoyed the enclosed goat petting zoo area – very clean and you can brush the goats’ coats. We then headed to see the tigers and lions and we were lucky enough to see a family of lions lounging in the sun. The lion cubs were adorable and even swatted at Dad a few times. Asia Quest also had some great monkey viewing and these large bats or were they flying foxes? We did go through an exhibit resembling a train station and it was sad to see all the “Departures” for the animals that are now extinct. Throughout the zoo, they have many large animal statues where the kids can climb on. I think my girls probably enjoyed doing that just as much as seeing the animals. One exhibit that you don’t want to miss is the manatee exhibit located in The Shores region. Their tank is enormous and we were lucky to arrive for feeding time . After seeing the manatees chow down on their feast of romaine lettuce, my clan was clamoring about being hungry so we ended up stopping at one of the on-site food areas. I’d highly recommend packing a picnic lunch with drinks (coolers are allowed in the zoo). The food is your typical “fast food” – hot dogs, fries, etc. and there weren’t any healthy options available at the food booth we visited. Plus, it’s expensive. I think we spent almost $20 on 4 hot dogs and one large fry to share. We didn’t even get drinks since I had water with me. After lunch, we headed to the reptile house. My girls were starting to wear out at this point and they started pleading, “when can we go on the rides”? After a full morning of seeing the animals, we decided to head to Jungle Jack’s Landing. We got lucky since there weren’t too many other patrons visiting. My girls had a ball. The rides are adorable and perfect for their ages (5 & 6). They got to ride most of them and did not have to wait in line. If we visit the Columbus Zoo again, I know that we’ll have to get ride wristbands. A word of advice: if you don’t want to do the rides, don’t mention it to your kids. Once they realize they are there, that is what they’ll want to do. I’d like to return to the Columbus Zoo again. They are opening a new polar bear exhibit this month and I’d like to see the exhibits we missed, Australia, the African Forest and more. If you visit in the summer, you can also buy passes for their on-site waterpark, Zoombezi Bay (opens May 22). If you live in Columbus, think about purchasing a gold season pass for only $99.99 and you can enjoy the zoo, Jungle Jack’s Landing and Zoombezi Bay all season long (if you purchase a pass online they are currently discounting the rate). Our family really packed a lot into our weekend stay in Columbus and it’s a great place to visit since it’s only 90 minutes from Mason. We’ll definitely return. I am so glad you wrote about COSI Kristin. I’ve always heard about it, but we’ve yet to make a trip. It’s def. been moved up on our list of things to do!